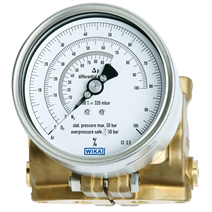 These high-quality gauges are characterised by their compact and robust design and are primarily used for level measurement on liquid gas tanks. With 11 different measuring cells all usual tank sizes in cryotechnology are covered. As a result of the large measuring range overlap of the respective measuring cells, the gauge installed on the tank can be adjusted to match a whole variety of gases such as Ar, O2, N2 or CO2, with a full-scale deflection over a complete 270 degree sweep. The span adjustment is accessible from outside and does not affect the zero point. The mechanical display and the optional electrical output signal are calibrated simultaneously and easily. 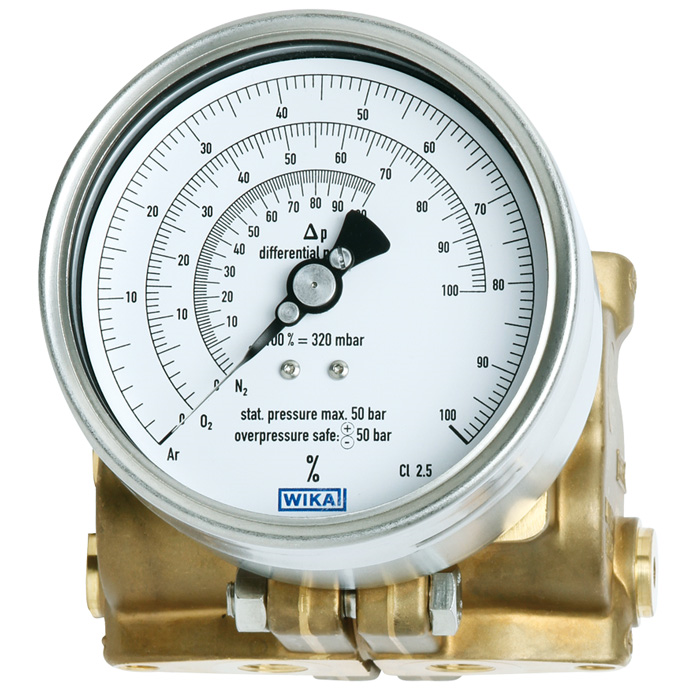 An optional valve manifold for flange mounting with working pressure indication makes the central measurement of both level and working pressure possible in the one instrument. The level display can be supplied with an optional, integrated 4 … 20 mA, 2-wire transmitter. Switch contacts for level and working pressure, as well as a transmitter for the working pressure can be retrofitted on site. The standard centre distance of 37 mm between the process connections can be adapted to a custom centre distance of 31 mm or 54 mm using adapters for flange mounting.